It’s been more than a week since I moved from central Wisconsin to New York and one of the more constant companions I’ve kept has been Tenement‘s current magnum opus, Predatory Headlights. Weeks ago I was already fighting the urge to review the record because it was clear from the outset that, although the large bulk of the songs are heavily immediate, it’d require patience and investment to fully understand as a whole. For nearly a decade now, Tenement’s been an important fixture of my life. After being brought into the greater DIY fold at the band’s former home base, The BFG, and playing (or booking) countless shows alongside the band, I’ve been able to keep a close eye on their artistic progression. All it took was one five song set for me to decide they were Wisconsin’s best band but even back in 2008 it would have been difficult to realistically predict the heights they’d eventually reach. 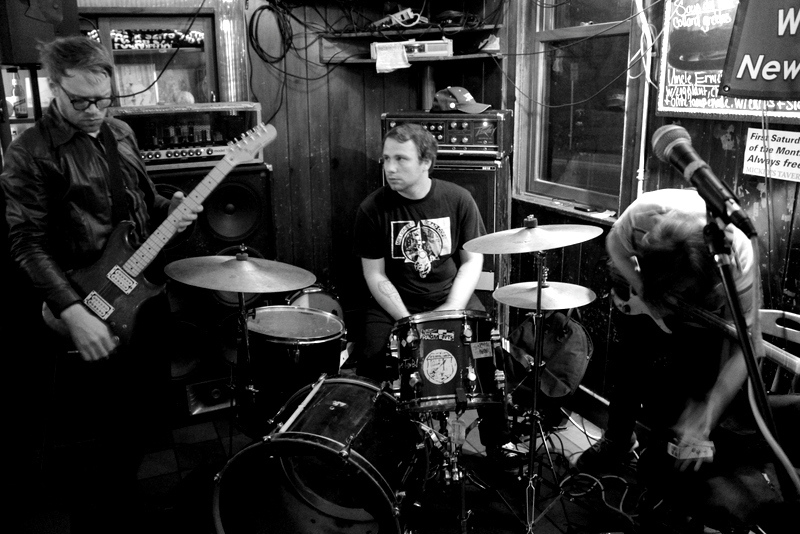 After two extraordinary full-lengths, nearly a dozen 7″ releases, and a revealing early career compilation [Full disclosure: I wrote one of the pieces in the compilation’s zine insert], the band finally signed to celebrated punk label Don Giovanni (years ago, they became the first non-New Jersey band that the label had ever approached), ensuring a catapult point for their already impressive ascension in name recognition. Now, the band’s riding a wave of acclaim for their first effort for the label: Predatory Headlights. Recorded largely at The BFG, like a lot of their previous work, Predatory Headlights thrives on subversion and challenging limitations. From it’s impressive scope (the record’s 25 songs and nearly 80 minutes in length) to the record’s boldest works, it’s an extraordinary feat of not only artistry but endurance. As alive as Predatory Headlights can sound and feel, it also comes off as weathered; a very natural byproduct of the band’s Wisconsin environment. It’s through that relative bleakness where Tenement’s consistently found novelistic inspiration, narrowing in on both the mundane and the minute with a deceptively sharp eye. Butchers, sidewalk cracks, broken homes, ants, flies, degenerates, criminals, and people who are just trying all show up various times throughout the band’s discography and no collection’s ever placed a greater emphasis on that subtle narrative through-line than Predatory Headlights. Tales of hurt, heartbreak, loss, and unfettered resilience dominate the double album’s intimidating span, rendering it an occasionally challenging listen due to the overwhelming amount of filth that the band so readily (and possibly bravely) presents. It’s a trait that seeps over into the nuanced production- a task capably handled by both guitarist/vocalist Amos Pitsch and Wisconsin mainstay Justin Perkins. For all the dirt, though, there are a few transcendental moments of sweetness, like the absolutely gorgeous string arrangement in the outro of the piano-driven front-half highlight “Ants + Flies” or the Sheer Mag-like aesthetics of the ensuing track, “Garden of Secrecy”. Finding the perfect balance between their intrinsically rough-hewn nature and a newfound vulnerability winds up serving Predatory Headlights well, creating a dynamic compelling enough to create a considerable pull. Aiding that are the songs where Tenement really gets to embrace their more free-form tendencies. For years, the trio have ended their sets with piercing noise excursions and harbor a wealth of knowledge in relation to free jazz, something that’s never been more clearly evidenced than on the record’s most divisive track, “A Frightening Place For Normal People”. On this track- more than any other the band’s ever released- Tenement indulge themselves with startling conviction and it pays off. A few recent reviews have found “A Frightening Place For Normal People” the record’s most problematic track; they’re missing the point. Tenement as a band have never strove to adhere to what’s expected, they’ve always worked towards a complete dismantling of their limitations. By intentionally throwing a prolonged left curve (and doing it so late in the record), a lot of people being put off is to be expected but there’s no better litmus test for the places Tenement are headed than (the very aptly titled) “A Frightening Place For Normal People”. By continuously exploring- and expanding- their boundaries outside traditional and/or conventional means, they’re following in the paths of composers like John Cage, Cecil Taylor, and the late Ornette Coleman, trusting their listeners to be adventurous- and capable- enough to meet them with more than just a faint inkling of critical thought. That sense of wonderment and exploration is likely Predatory Headlights‘ strongest asset, ensuring that both the band and record never sacrifice too much momentum even with stretches that lean more towards the structure of a singles compilation (which isn’t saying much; a Tenement singles compilation would be more affirming than most bands’ full efforts). None of the songs on Predatory Headlights sound like the band’s coasting on their enviable talent, instead most carry the sound of a band pushing themselves to achieve something greater than their past work and frequently succeeding. A dominant handful sound vibrant and incredibly inspired; there’s never a weak moment in the midst of the shambolic chaos the band’s willed into existence. Auxiliary arrangements only enhance Predatory Headlights‘ sense of individualism, providing guitarist/vocalist Amos Pitsch with a deeply impressive showcase as a composer alongside the band’s consistently powerful rhythm section (consisting of bassist Jesse Ponkamo and drummer Eric Mayer). On the whole, Predatory Headlights highlights every facet of the band’s enviably extensive strengths. Atmospheric, propulsive, severe, and more than a little manic, it contains the breadth of Tenement. From the obvious influences that split the difference between punk and pop without sacrificing any integrity (The Figgs and Hickey definitely come to mind) to the artists that refused to bend to conventionality (Albert Ayler, Erik Satie) to the prevailing sense of a hard-won DIY ethos that’s been at the core of the band from the beginning, Predatory Headlights is a shockingly complete look at one of what may very well be the most important bands working today. Predatory Headlights isn’t a lapse in judgment, it’s far too carefully structured and meticulous to be lost to oversight. While it might be an unintentional challenge, it’s most certainly a statement release. Tenement, after years of deserving the national spotlight, have arrived. They’re not going to cater to easy expectations, they’re going to continue eschewing gloss in favor of celebrating the murk of America’s lower-middle class, relentlessly turning things perceived or regarded as ugly into something tantalizing and beautiful (I’ve compared Pitsch’s vision of America to John Steinbeck multiple times over but the comparison’s never felt more warranted than it is here). Reviews from high-profile publications like the New York Times and Pitchfork aren’t going to change the band’s modus operandi; Tenement are still very much a band that will play basements and go out of their way to help younger bands. More than anything, though, Predatory Headlights has me convinced that Tenement aren’t just part of the new face of punk- they’re the face of punk to come. Listen to Predatory Headlights on Spotify here and watch the complete collection of videos I’ve shot of the band over the years below. For those of you in the New York City area, Tenement will be playing with Big Zit, Ivy, Nancy, and Warthog at The Acheron and their live set’s not one to be missed. You can purchase tickets for the show here. Predatory Headlights can be ordered directly from Don Giovanni here.